This is an art fabric block produced by Texas Hill Country artist Kathleen McElwaine. Kathleen is known for her original whimsical watercolors featuring familiar Texas motifs. Her art is professionally printed on Kona cotton and is colorfast and washable. Incorporate it into a quilt, pillow, bag or other sewing project....or just simply frame it for a beautiful addition to your wall art. 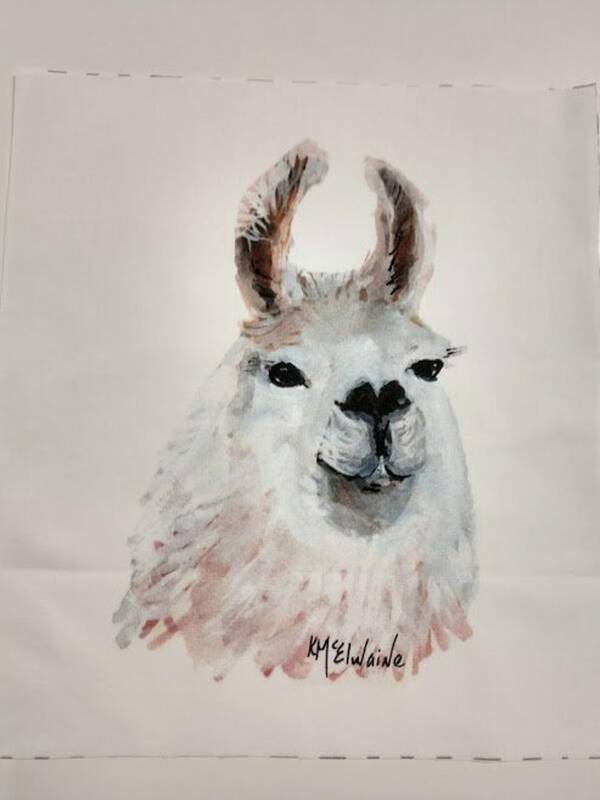 This listing is for one art fabric block measuring 9"x10" featuring a Llama. What a cute Llama. This shop stocks very nice quality items. Very efficient seller. At this time, the only forms of payment I accept are PayPal, ETSY Gift Cards or Direct Pay. If you live within the state of Texas you will be charged state sales tax. Please examine pictures and read item description carefully and ask any questions before you make your purchase. I want you to love your items and will always try to work something out with you in the event of a problem; please contact me within 7 days of receipt of the item. If a return becomes necessary, you will be responsible for shipping charges back to me and a 10% restocking fee. Merchandise will be shipped via USPS within 2 business days of payment. I cannot be responsible for packages once they leave my possession, so if you would like to purchase insurance for the item, please let me know this at the time of your order. Your order will be shipped to the "ship to" address specified on your Etsy Direct account. If you need it shipped to a different address, please contact me at the time of order to make arrangements. Multiple quantities of one yard orders of the same fabric will be shipped as continuous yardage unless otherwise requested. If you are interested in a custom order then please contact me. RESERVE listings are good for 24 hours and then will be removed.